I received an email from an editor recently, a long-time Avid user, which started more or less like this: “I’m using MC5 on a TV series. But I really don’t like it. And the other editors on the show all have the same impression.” He went on to explain how much he dislikes the FCP model and prefers Avid’s trim tools, especially asymmetrical trim. But MC5 removes much of the fluidity that he loved in older versions of Media Composer. My reaction is that while MC5 felt different, Version 5.5 brings back much of the feel of Version 4. The trick to making it work is, naturally, in your settings. If you adjust things properly, you will find that 5.5 functions pretty much as you expect, and offers several important new features, including real-time audio effects, stereo tracks, and the ability to search the entire project for clipnames or descriptions (or anything else, for that matter). If you pay an extra fee, you can search for audio dialog, as well (PhraseFind). 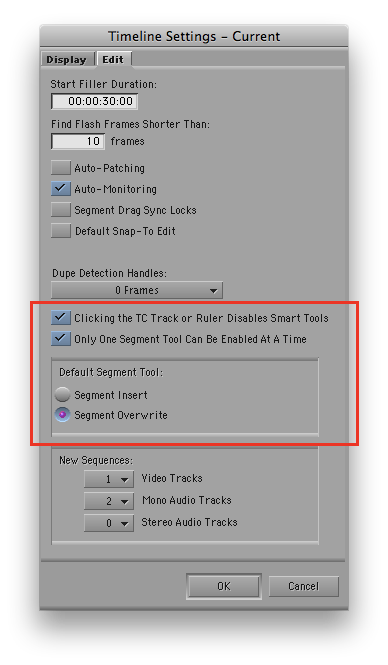 Be sure to select “Clicking the TC Track or Ruler Disables Smart Tools.” That brings back traditional behavior — click the timecode track and segment mode turns off. Over time you may find that you prefer this to be turned off, but if you want familiarity, leave it on. Selecting “Only One Segment Tool Can Be Enabled at a Time” also makes MC5.5 work like Version 4 — when you choose Red or Yellow Segment mode, the other turns off. And finally, your default segment tool should be “Overwrite.” I could go on at length about this, but if you want fewer surprises, use Overwrite. Note that all these settings are not this way by default — that’s a big part of why long-time Media Composer users get so frustrated with v5 and 5.5. Start by turning off the Linked Selection button. For long-time users, this single feature is probably responsible for more frustration than anything else. Turn all the Smart Tools off. In Version 5.5, they’ll stay off. 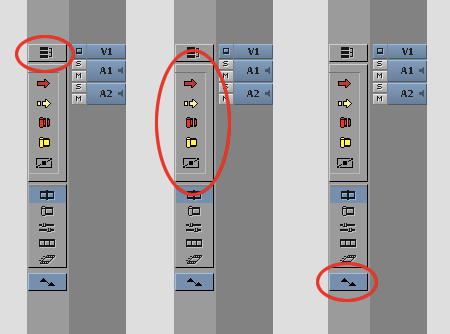 Turn on the keyframe tool — when you move your cursor over a keyframe you’ll be able to adjust it. Be sure to put both segment mode buttons on your keyboard. When you need to move a clip, just hit the mode you want. I also like to put the waveform toggle on the keyboard (“Wa” in the illustration). Nothing special to be done here. But important changes in Version 5.5 bring back the responsiveness and precision that you were used to in Version 4 when selecting rollers. And it fixes the bug that took you out of Trim Mode if you accidentally clicked too far away from a roller. 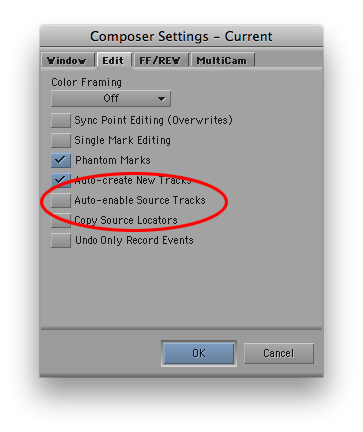 Be sure to de-select “Auto-enable Source Tracks.” This brings back the MC4 feature that remembered source track selection. Again, it is selected, rather than deselected, by default (see this post). Yes, some of the keyboard modifiers and shortcuts have changed. It’ll undoubtedly be frustrating initially, but it’s not the end of the world. These are the ones you’ll need most often. To drag a segment vertically while allowing no movement side-to-side, use Command-Shift-Drag. To enter Slip and Slide from Trim Mode, get into Trim Mode any way you like, then double-click an existing roller to slip, double-click again to slide. To lasso transitions and clips anywhere in the timeline, hold down the Option key (rather than the command key) and drag. To measure a group of clips or sequences, select them, then right-click on one of them and choose “Get Bin Info.” The Console window will open, with a total length listed. Once you’ve got all these things set up, MC should feel pretty familiar to you. After that, you’ll want to explore some of the new features. Start with the Track Control Panel, where you can add real-time audio effects. Keep in mind that you can’t change an effect internally — it stays constant throughout your sequence — but it can still be very useful for many things, such as adding a ring-out in music. You can also turn waveforms on or off on a track-by-track basis. In addition, MC5 lets you create and use stereo tracks and clips, so you can treat a stereo pair as a single object in the timeline. You’ll also want to check out the new Find features (Command-F). They let you to search throughout your project. And you’ll need an introduction to Advanced Keyframes, which are now used for most effects. They’re much more powerful, but they take some getting used to. You can find all of that and more in my book, Avid Agility. This entry was posted on September 27, 2011 at 7:30 am and is filed under Avid, Avid Technical Tips, Avid vs. Final Cut. You can subscribe via RSS 2.0 feed to this post's comments. You can comment below, or link to this permanent URL from your own site. I would prefer if there were a checkbox in the settings that just said “Disable smart tools”. To me, this piece is gold! i will refer everyone who works on MC5 for the first time to this page because you answer the questions that we all ask. Thanks so much for this, I too have been repeating the above advice to everyone I’ve worked with for the past couple of jobs. I would also love a ‘Disable Smart Tool’ function. One thing I would love to change, is putting a toggle in either the Audio mixer or the Audio tool to easily switch between direct out, stereo and mono (although I’ve never ever needed to go out mono). It’s so irritating to have to go to the settings tab for something I consider routine.